portatour® for Dynamics CRM: visit more customers and drive fewer miles at the push of a button. You know the challenge to field reps: visit as many customers as possible, but distances are long and many hours are wasted in the car. A perfectly optimized route would be helpful: fewer miles mean lower fuel costs and time for what really matters – more customers and additional appointments. portatour® makes this easy: at the push of a button, each field rep automatically gets a route plan optimized to visit more customers and drive fewer miles. portatour® is available for Microsoft Dynamics CRM 2011 and 2013. As of March 2015, Microsoft Dynamics CRM 2015 is also supported – both as an “On Premise” installation and “On Demand” in the cloud. You set the goals for the field reps: after installing the solution, you define which Accounts, Contacts, or Leads should be visited, at which frequency should the visits be made, how much time should be invested in a single visit and many other parameters. The tiresome work of route-planning is done by portatour®. At the push of one button, the schedules are calculated to maximize your results according to your deinfed strategy. Following your rules, portatour® automatically selects which customers to call while also optimizing the driving route. Everyone in the field visiting customers has faced this problem: there are some places without mobile internet access. There is also no access to Microsoft Dynamics CRM. Thanks to the offline-mode of portatour®, you can access your route-planner anytime and anywhere. All necessary data for your daily work in outside sales are downloaded as an offline copy on your device – be it laptop, smartphone or tablet. You can continue working offline: accessing customer data, entering call reports, getting the overview of your daily schedule are all possible. Once you are back online, your changes are automatically uploaded and synchronized with Dynamics CRM at regular intervals. Do you want to start driving optimized routes today? Get your free trial account of portatour® for Microsoft Dynamics CRM. 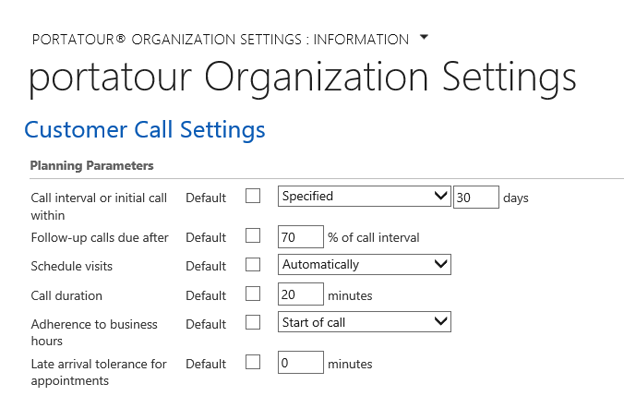 The installation in your Dynamics CRM can be done in 5 minutes; you or your administrator can make all necessary configurations. You are ready to go within 60 minutes. For a smooth rollout in your enterprise, our consultants are here to help. Do you have questions? Write to sales@portatour.com.